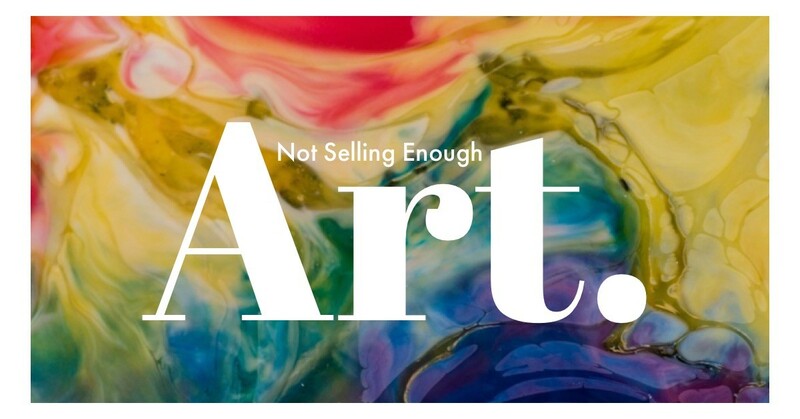 Why Aren’t You Selling Enough Art? Each week I write a brand new article to support members of our three wonderful groups on Facebook, The Artists Exchange, The Artists Directory, and The Artist Hangout. This week we take another look at why we might not be selling our art as much, or as frequently as we would like. One of the big questions I get asked whenever I work with new artists just breaking into the art world is “Why isn’t my art selling”, and this is usually followed up with them immediately thinking that it is simply because their art isn’t any good and then assumption that this has to be the absolute reason why their work doesn’t sell. My response is usually something along the lines of “if your art isn’t any good, then there’s no hope for any of us then.” That response comes from knowing that often there’s absolutely nothing at all wrong with the work at all, and even more often that it wouldn’t look out of place on a gallery wall. Artists are fantastic at not having confidence in their own works and if that work doesn’t sell, the immediate reaction is often that it is because it’s no good. This isn’t even a question that gets asked only by new artists though. I know some very experienced and very talented professional artists that have said or at least thought the exact same thing when they have been going through dry spells of not making enough, or not making any sales at all. I know. I have had those thoughts too and even now I can succumb to periods of self-doubt with the best of them. 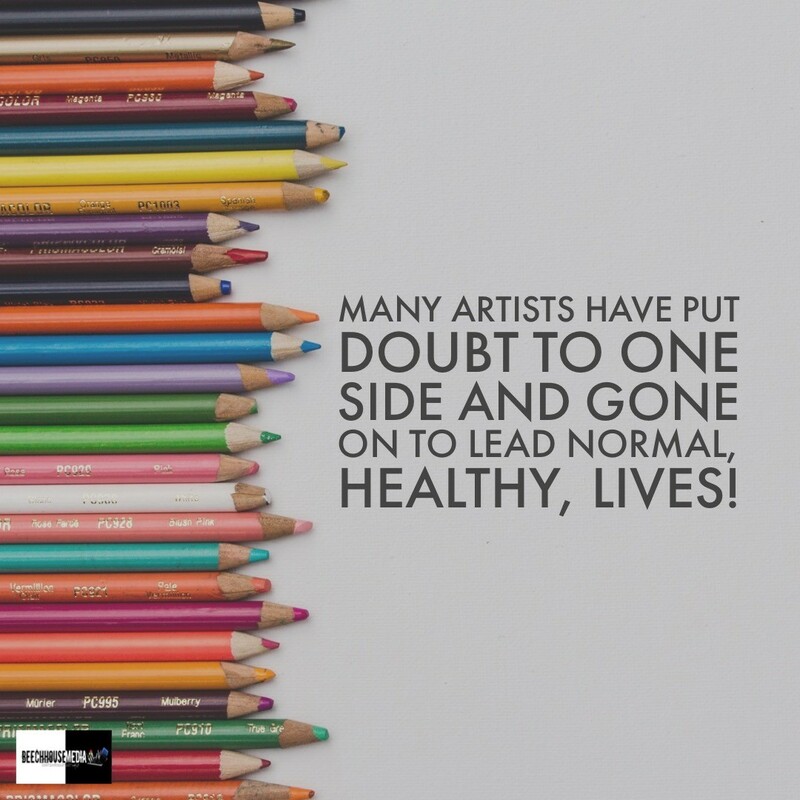 That’s how the art world and being an artist works and if you are selling consistently in volumes that sustain your artistic life fully, you really are one of the few. That shouldn’t put you off creating art and getting it out there though. It’s a mind-set that you have to try to stop, because believing that your art is the most obvious problem is ignoring the other and often much more plausible reasons why your art isn’t quite finding its feet. Even bad art sells with the right marketing and you only have to take a step into the auction rooms to figure that out. To this day and some thirty-something years in, I still get taken aback when I hear of a work fetching way more than anyone thought it would. There are works that have sold that really have shocked me either because of the price they went under the hammer for or because I really wouldn’t want that work hanging on my wall and that’s from someone who really does love all art, well maybe with the exception of the stuff created by Hitler. Art is subjective. Someone somewhere will love what you have created, it’s about finding out exactly where that person hangs out and making sure that you can at least get the ducks in the same pond, even if they’re not all quite lined up. 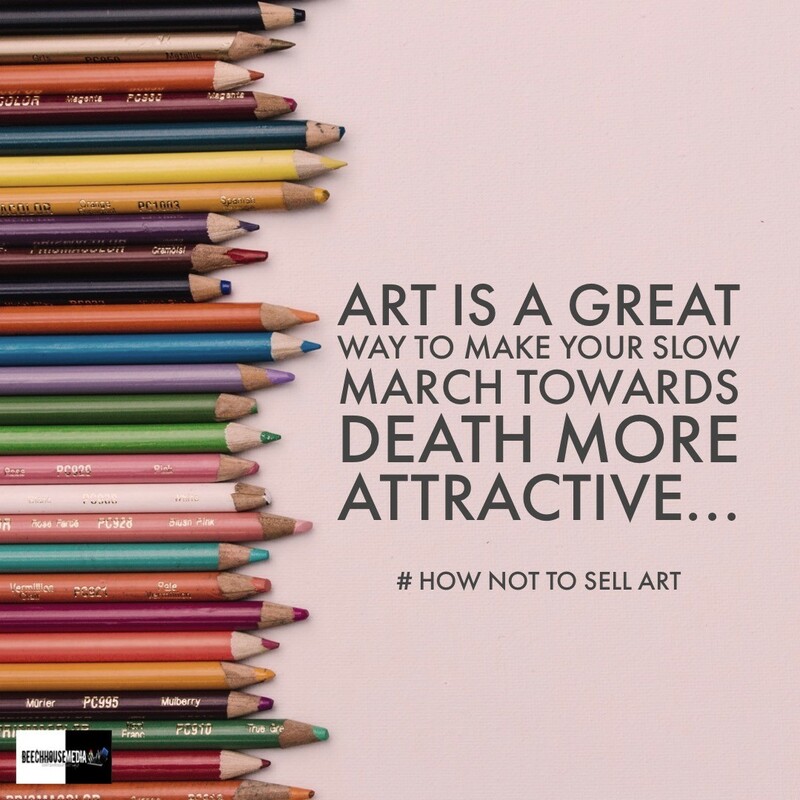 There are so many factors that contribute to people deciding to buy an artwork, and not being aware of at least some of those factors can stifle your chances and make you think that it’s all you. Thinking that the art isn’t good enough is often the default because we artists are often our own worst critics. When art doesn’t sell it is easy to think that there must be something wrong with the art when the reality is that a lack of sales could be down to something else entirely, and usually something that’s only obvious when someone points it out. Let’s get the first 600-lb gorilla out of the room before we make a start. Sometimes it really is that your work doesn’t set the world alight, and sometimes we really do have to take a step back and recognize this. You will know when half a dozen people say “that’s a really nice frame” but never once mention the art that is within it. But those people might still buy it because they bought into you instead, or maybe they won’t. It is a possibility that your art might not be good enough but if you have been creating and have had some positive reactions from people you trust enough to give you their honest opinion, it’s probably not the single reason that your work isn’t selling if indeed it is a legitimate reason at all. Like I said earlier, art is subjective and even bad art sells, but what’s bad anyway? We could talk about technique all day. In my experience over the years of not only creating and selling my work, but from visiting many galleries, exhibitions and art sales, and talking to hundreds of artists, I have seen works that haven’t been technically great go for mega-money and works that have been brilliant that get ignored. Wrong perspectives, shadows in the wrong places, these issues are common and every artist makes mistakes regardless of where they have learned their skill or where they are at right now. Technique gets better with practice and from observing other artworks and learning more about art, artists and art history. In short, the technical issues are fixable with time and practice but they will probably never be perfect and that’s a good thing, it keeps you on your toes. There’s a question that has been asked many times, are artists born, or are artists taught? I don’t know the answer to this but lots of people have differing opinions, and it’s a little too deep to go into today. But one thing I can say is that I know some truly outstanding artists who are both successful and yet never dreamed that they would end up in a creative career and many of them were self-taught, and lots of them are making a living. So let’s put the assumption that the lack of sales is down to the quality of your work to one side. What else should we be looking at that might be hurting sales? The more obvious reasons from my own experience is that you are simply not producing enough art, or you are only creating it sporadically, or you might be over-sharing in a short space of time. If you are not producing enough art, you are not building up a portfolio and keeping it alive. A portfolio needs to be fed. I’m a big believer in making your portfolio a living document and it should have new works introduced and older works to show progression, but it always has to look and feel fresh. If you don’t produce enough art then your inventory stays too small to surface, and more so when you are selling the work online where relevancy and uniqueness are contributing factors to how search engines and social media platforms surface you work. Technically you become more and more proficient at doing things the more you do them so a lack of productivity could be slowing the building of those skills down. I don’t think that there is ever a point that you can ever produce too much art. It all contributes to either your portfolio or your skill-set, but it also contributes to your inventory and just like retail stores focus on bringing people back, you have to give people a reason to come back to you and you can do that with new work. I do think though that it is entirely feasible to release too much work or more specifically, to release too much work in too short a space of time and more so when you are only using tools such as social media to get your work seen. The social media algorithms used by every one of the social media platforms will be looking for relevancy and uniqueness, so releasing half a dozen pieces and sharing them all in the space of an hour will do absolutely nothing positive to your reach unless you make sure that every single one of those posts provides sufficient value for them to be widely shared. We need to develop and evolve as artists so a constant pursuit of mastery is what we do have to strive for, but you will never get to the point of mastering anything if you don’t put the hours, the practice, and the learning in. In short, you need to find a balance of releasing new works that works for you and your audience, and you have to keep creating even if you don’t ever plan on releasing it. Not everything you create needs to even be seen but you do need a strong portfolio with plenty of work and even more so when you are selling online. What you don’t have to do is flood your page with every single piece you have worked on, at least not in a short space of time. Instead consider how each of those posts could be spread across a planned timeline of post activity. That not only avoids the sudden splurge of posting which is often immediately followed up with nothing at all or a meme that’s way more popular than your art, (oh how I have seen my last one grow) but it avoids having those inconsistent dry spells on your page where you post nothing relevant if anything at all. If there’s nothing new then people won’t come back. Want proof? Go visit the millions of abandoned artist websites and look at the last time they got a new post. One of the things I see a lot of when I work with my own clients is that they love to create posts with 30-photos. Honestly, sometimes it’s like being made to sit through the collection of a thousand and one holiday snaps. Here’s Uncle Bert doing a back-flip, here’s a random cat, here’s little Freddy dancing, look, yes, I know I didn’t get the whole of him. The great thing about social media though is that we can scroll right on past them whereas we can’t if we’re sat next to you and having a cup of tea. The cover post containing an album of photos and images might get lots of likes but if you look at some of these posts across Facebook you will notice more often than not that when you open the post up to see the other images, very few if any of those images have been loved, liked, wowed, or commented on. If they have, it’s either by a super-fan or a stalker, or someone who is related. Those kinds of posts seem to work better for subjects such as local history, how your home town once looked but they rarely work for collections of your WIPs and works. Next time you see one of those multi-image posts appear on your timeline, take a look at the number of likes each one of those images has, chances are that a lot of them will have much fewer reactions than the cover post has. Go on, give each of them a like and then check back in a week. There are hundreds of possible reasons why your art might not be flying off the walls and onto well, other walls, but we don’t always recognise the social cues we get that can tell us that there’s something other than the art that’s wrong. The more obvious reasons and ones that every art critic will tell you along with every how to do it website are the ones such as, your work isn’t recognisable as yours. Whilst that’s a problem when it comes to collectors, in some art markets it is really less of an issue. There should always be something in a work that links it to you, a theme, a style, something that makes the work yours, but how much of that is expected, is really determined by your market, by your people. If you are in a gallery then absolutely consistency is vital, but if you are selling pin badges on Zazzle, it’s an entirely different market and there is nothing wrong with either galleries or print on demand, they feed different markets. I’ve done both and love print on demand more because that’s where a lot of, but certainly not all of my people are. My passion and my consistency stem from my landscapes and abstracts. The works that my collectors buy are usually my landscapes and mostly the ones I create using blue palettes, and then I have some collectors who will buy only my abstracts but I create other work that sells in other markets too. Book covers, and for some bizarre reason restaurant menus, user interfaces and logos, sometimes it can be a mixed bag but art is often about survival and paying the bills as an artist. It’s certainly not all arty parties and canapes. What you are less likely to see is some of my typography and 8-bit retro-style and some other styles of work next to my landscapes. Some of my work never appears on social media at all and that’s because I try to keep it very separate, some of it is only ever offered to collectors, other works only appear on some platforms or on my other website behind a log in. Now five years ago it was a completely different story, back then it could only be described as chaotic and even managed to confuse me. In short, and this is the hardest thing to figure out, you have to find where your people are for you and your work. Some of my markets hang out on Facebook but despite the assumption that we often make that everyone has a social media account, the reality is that they don’t and some art buyers still don’t go online at all. I have some collectors who never buy anything online at all because they don’t own a computer. So there are two things we can take from that, that you’re not quite finding the market, and/or you might appear to be trying to be everything to everyone in exactly the same space at the very same time. Know your market, spread the love. We do need to trust our instincts more but one of the things that we need to do less of is to take wildly uninformed guesses. With experience comes instinct, but instinct doesn’t always give us the right answer for the exact moment we are in. We often instinctively know that something is or isn’t right especially with our art, but when it comes to marketing it’s much more difficult because markets can and do change a lot. The art world isn’t what it was five years ago, and there’s no doubt that it will change again at some point so we do have to take notice of the wider art world and listen to what people are telling us either verbally or by their actions and inaction's and then we have to adapt. If we don’t do this then we often make a guess and if we don’t know what we don’t know the guess bears little fruit and can end up costing us. The knack really hinges on knowing who your audience are and if you don’t already know that then you are already at a disadvantage. Every interaction we have with people brings some data that informs us with it. Whether it’s a social cue that they love your work but can’t afford it, or that they would love it more if it was bigger or smaller or offered on an alternative medium, or they simply love it because they buy into you, those are bits of data that begin to tell the story of how people want to buy our work and whether or not they will. There are many ways we can find out what our markets want using quantitative and qualitative research and a few years back I remember coming across an interesting article on surveys which I managed to dig out again from Google Ventures and which you can read right here. If we don’t recognise those social cues and interactions we miss out on being able to surface the data in one place so that we can figure out the real story. We ask questions but we don’t ask them in the right way, or we stop listening altogether. So the take-away here is that we need to listen and we need to engage and we need to not be shy in asking for what we want. Yes, there are artists who are frightened of selling their work. It can be daunting, and even the most experienced artists occasionally go through it. Will the buyer still love it when they get it home, will it end up in the trash, or will it print out well, and of course that nagging self-doubt of, is my work good enough to sell, how do I come up with a price, or I’m just too shy to ask for the sale will forever be somewhere at the back of our minds. I have seen experienced artists become paralysed by fear but it does get easier. Fear comes mostly from over-thinking and dreaming up yet another excuse to not do something that puts us outside of our comfort zone. Sounds a little harsh but sometimes as artists we do let self-doubt get in the way and we find another excuse to not do something because we think it’s too hard or too difficult. If this is what’s holding you back you need to recognise it and tackle it head on because that’s the only way. Eventually you come to realise that fear is just something that happens. It has struck me down countless times over the years but the knack here is really to just embrace it and use it as a driver. Just like over sharing of social media posts, people can get tired and tune out when you become that nightmare sales person who won’t take no for an answer. Pushy sales people should be outlawed, good business if you ever want to repeat it should be about making the person happy and providing them with a value. I see this a lot and it’s horrible when you have put your heart and soul into your art for so many hours and no one is interested enough to make the purchase. Again, that might not be anything to do with your art at all, it might be that you just haven’t found your people. Pretty much everything you will read here today will always come back to that one major factor, you have to know who your people are and you have to know what they want, then you have to give them more of that until they ask for something different. Buying anything shouldn’t be a chore with maybe the exception of nuclear weapons and arms or anything illegal. There should be controls and processes in place for those and you might want to be picky about who you sell to. 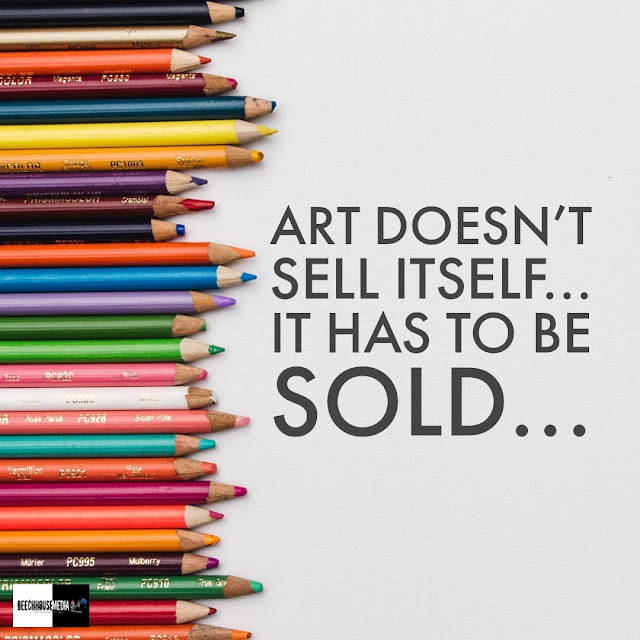 Certainly buying your art should be a very simple process but you would be surprised at just how many times I have seen fantastic artworks online with the most crucial information completely missing, and sometimes I have no idea if the work is for sale at all. Desperate plugging of a product will do one thing, it will de-sensitize people and they will tune out. Having said that, when you do plug your latest artwork, people need to know how to buy it and where to buy it from. It shouldn’t be a test or an online examination to figure it out. Yet so many people write this sentence on their social posts: IM me for details, or, available from the usual places, or, my least favourite line ever, 24x30, oil. My response to that latter one is usually along the lines of, FFS, WTF, and please, with a side of sarcasm. I turn into a hybrid of Ricky Gervais and Gordon Ramsay. Make sure those essential details are included at least on your website outside of Facebook or on your Facebook business page. I get that people have privacy concerns but here’s a little secret, you really won’t sell very much of anything if you don’t let people know how and where to buy your work from. About three years ago I made a comment on one of the social networks, it could have been Google Plus (RIP and we miss you already), I forget exactly which one but I asked the question, “Where can I buy this?” and to this very day I have never had a response. I’ve moved on now so there’s no point trying. I have lost count of the times I have written right here on this site that engagement is the most crucial metric on social media but I’m going to say it again because it really is. If you ignore everyone who makes a connection with you that gives you even the sniff of a social cue that they would like to buy your work then your sales will be fewer or you will make very few sales if any at all. But you really shouldn’t ignore anyone at all. Social media is about bringing communities together for the most part and people who want to be in your community and who like your page and try to engage are already your people and they will know other people who could be your people too. It’s your job to be the Town Mayor and bring everyone together and build up those relationships and a level of trust. Trust is difficult to build online especially when we hear so many stories of bad players but it is entirely possible. There are people who have become my friends on Facebook and even though we’ve never physically met, I would invite them around for coffee, share a meal, and do what good friends do, but equally there are people I have met who I probably wouldn’t. Trust works both ways even online. At the risk of sounding like some inspirational poster, you do have to believe in yourself and your ability and your art because if you don’t, no one else will either. But it’s that believing in yourself that is one of the hardest things that you need to do. You were the fastest swimmer at one time, you can do anything you want. One of my measures of self-belief these days is to ask myself if I would be happy to hang my painting on the wall in my home. If I would then I figure that someone else might want to too, but if I don’t, I archive it until, and if I ever change my mind. I might throw the odd one out on social media just to gauge the reaction but mostly you’ll only ever see around 20% of the art I create on Facebook. I can’t say for sure one way or the other, maybe your technique needs to improve but so does every artists, that’s why we keep practicing and refining and learning. But the reality is that there could be another hundred or two hundred or even a thousand other reasons that your work isn’t selling. Mostly it’s about knowing who your people are to begin with, building a relationship and I even believe that there are a lot of times when the art really does become even secondary to that. Sometimes people really do just buy into you. In the words of all those inspirational posters… be the best you… or whatever, but please, find your people! You can also follow me on Facebook at: https://facebook.com/beechhousemedia where you will also find regular free reference photos of interesting subjects and places I visit. You can also follow me on Twitter @beechhouseart and on Pinterest here. If you would like to support the upkeep of this site or maybe just buy me a coffee, you can do so right here! I will even mention you and your website on one of the pages on this site as long as it's legal, not spammy, usual stuff, many thanks! Yes, without a doubt, finding your people is of ultra importance. Finding the people who will pay what you ask is another thing. Great article!